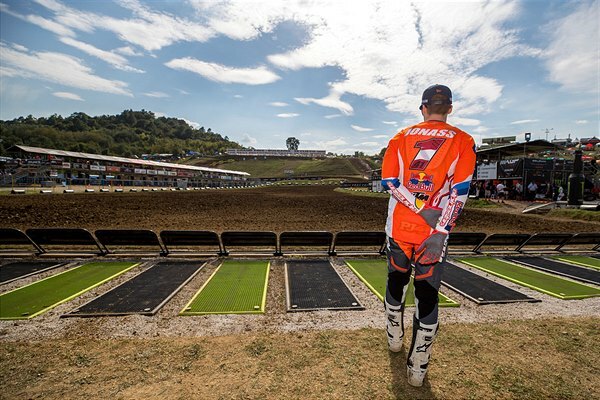 The fast, wide layout of the Sevlievo hard-pack welcomed MXGP back for the first time since 2014 and gave the older element of the Grand Prix paddock the chance to reacquaint themselves with the steep uphills and hard braking tests of the descents. Good weather persisted through the weekend leading to a dry and rippled track with lap-times close between the athletes. 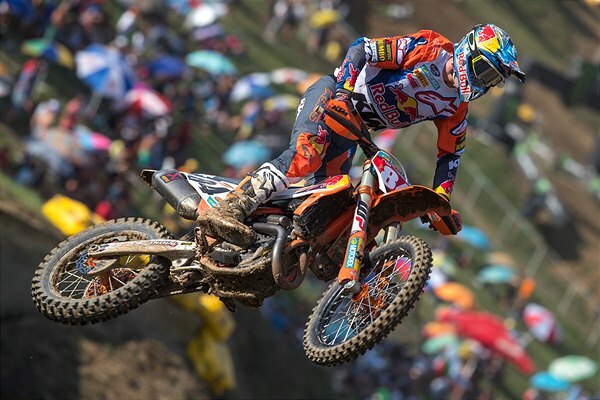 Jeffrey Herlings did not complete the clean sweep on Saturday. The championship leader was outpaced by Tim Gajser in Free Practice but set the quickest lap-time by almost two seconds in Timed Practice and cleared-off for his tenth Qualification Heat victory when it counted. 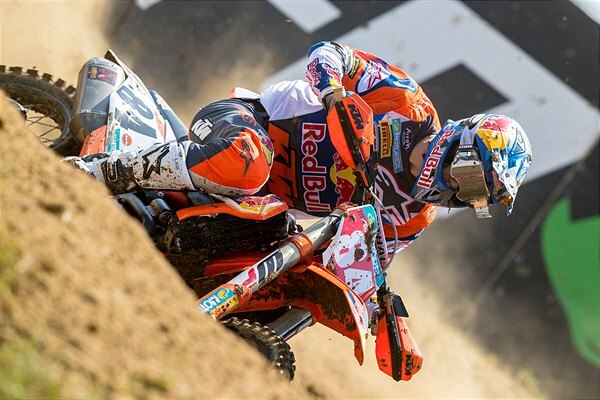 Herlings then took charge of the opening moto from Gajser and ran free to his ninth chequered flag in a row. 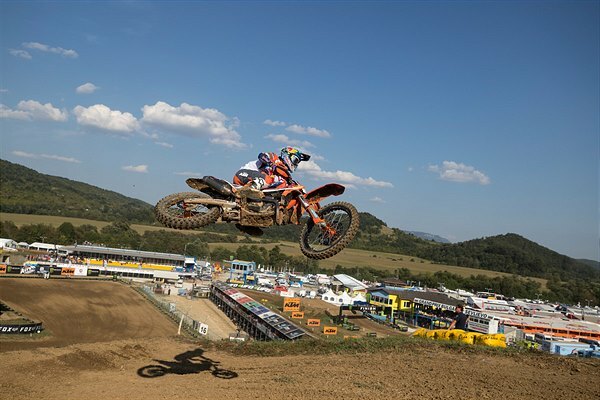 The second affair produced a similar outcome once Herlings moved past his teammate. 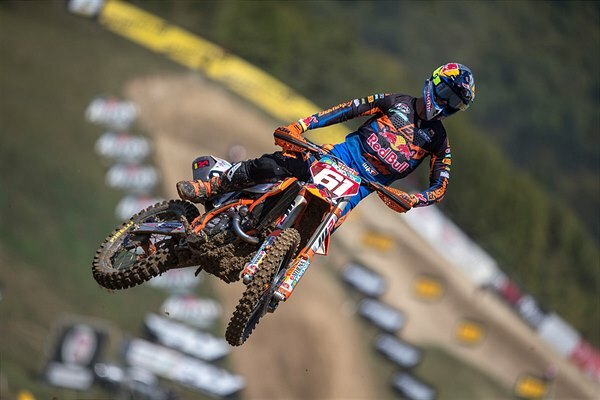 Red Bull KTM classified 1-2 on the track but Herlings toasted his fourteenth overall GP win from seventeen rounds on the KTM 450 SX-F (the sixteen he has contested) and his twelfth ‘1-1’. 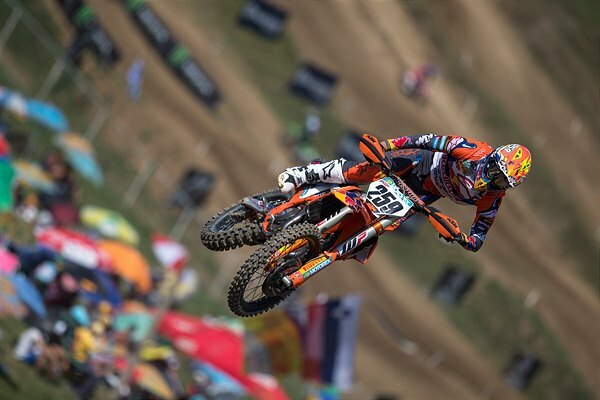 He also stretched his margin in the MXGP standings to 73 points. 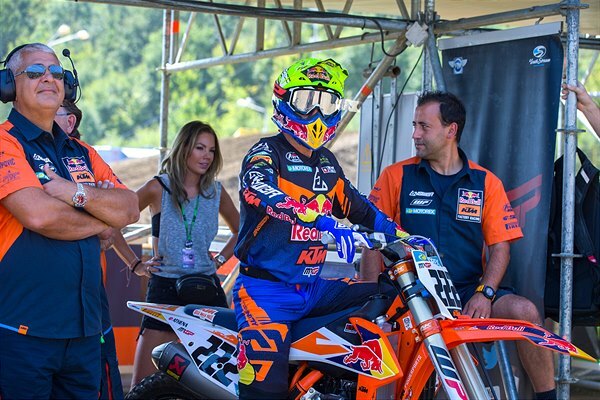 World Champion Tony Cairoli’s preparation for Bulgaria was affected by the knee he tweaked in the first moto in Switzerland. The Italian was still able to set a mean pace at Sevlievo but sadly his first race was hindered by a falling Max Anstie on the opening lap and he had to ride hard to make eighth place by the finish line. A holeshot saw #222 at the front of the pack in the second moto. He was overtaken by Herlings but clung to the distant roost of his teammate. Tony’s runner-up position was his best since the second moto in Belgium. The 8-2 meant he rounded-off the day with 4th overall. Glenn Coldenhoff recovered from a tough Qualification outing and 13th pick in the start gate to record a 9-7 for 7th in the MXGP field. 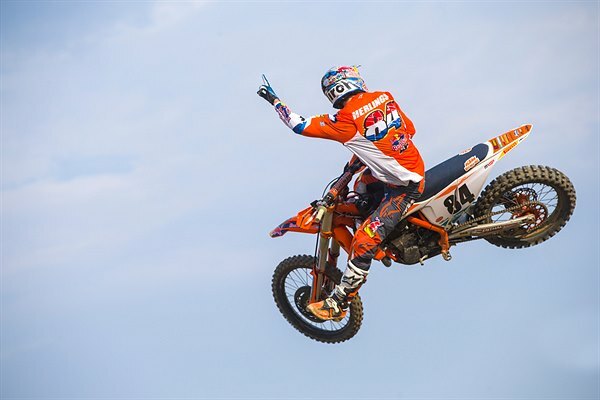 The Dutchman ended the weekend encouraged by his second moto launch in the top five and a rate of speed and performance that showed improvement across the difficult terrain. 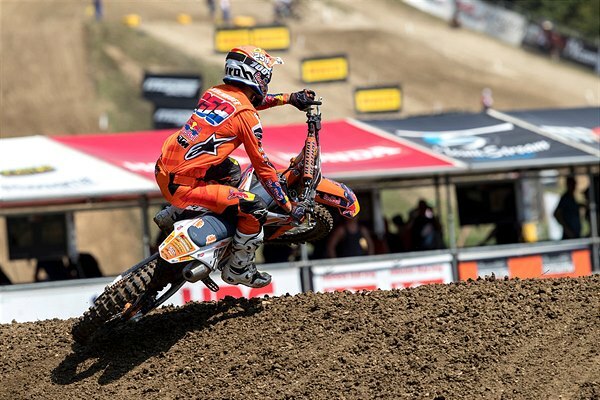 The Red Bull KTM duel for the title in MX2 initially swung towards defending number one Pauls Jonass. 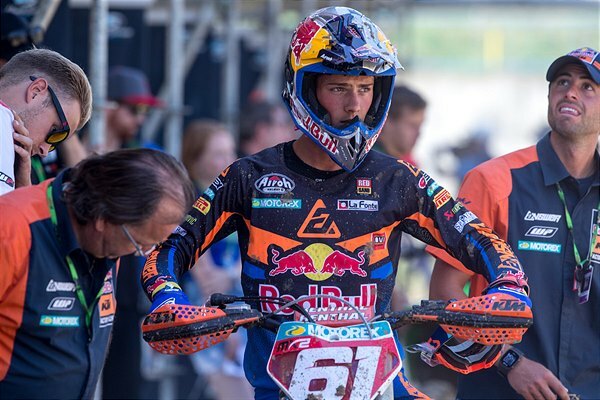 The Latvian coped with the holeshotting Jorge Prado on the KTM 250 SX-F in the first moto and moved past the younger Spaniard to eventually win by five seconds. Prado fired back to win his fifth second moto in succession. Jonass had been giving chase in the early phases of the 30 minutes and 2 laps distance but lost the front end of the #1 machine through one of the sections that had been watered to contain the dust through the warm afternoon sun. Pauls continued with a slight battered SX-F and rallied back to 3rd place. Jorge thrived on the Sevlievo course and was able to deal with the threat of Hunter Lawrence on the last two laps. Prado has now won 10 Grands Prix and missed the podium only twice all season. The window between the two KTM stars is 30 points with 150 left to win in Turkey, Holland and Italy. The 2018 edition of this meeting that showcases the best young international motocross talent took place at the Horsham circuit in the depths of Australia. Czech teenager Petr Polak used his 125 SX to claim the final podium spot in the 125cc division but the trio of Caden Braswell (USA), Kay de Wolf (NED) and Kay Karssemakers (NED) swept the board in the 85cc contest with the American celebrating his ranking as the new 85 FIM World Champion. KTM also grasped second and third places on the 65cc podium with Enzo Temmerman (USA) and Brando Rispoli (ITA). Back in MXGP and the first Grand Prix of Turkey for ten years will take place at the new circuit of Afyonkarahisar next weekend.